Late 2018 saw industry teams formed to respond to a joint requirement of the Dutch and Belgian navies for a new class of mine countermeasures vessels. Among the companies responding to the programme are French shipbuilders Chantiers de l’Atlantique (former known as STX France, which is currently the subject of a potential acquisition by Fincantieri) and Socarenam, who are partnering with EDR in Belgium to bid for the programme, which will see up to 12 new vessels built. The consortium that is hoping to build the vessels, Sea Naval Solutions, is proposing a multi-role vessel first unveiled by Chantiers de l‘Atlantique in 2016. The Deviceseas design is intended as a ‘mothership’ for autonomous mine countermeasures systems and would embark unmanned surface vessels (USVs) and a number of underwater systems including autonomous underwater vehicles (AUVs) and remotely operated vehicles (ROVs). 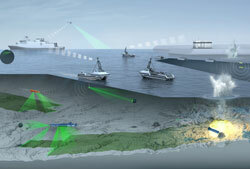 The proposed vessel also has a dedicated launch and recovery system (LARS) developed by Chantiers de l‘Atlantique in collaboration with NOV BLM, part of offshore company NOV.
Also forming a consortium responding to the joint Franco-Belgian programme is Belgium Naval & Robotics, a partnership between Naval Group and ECA Robotics, who have collaborated on mine countermeasures and minehunting for many years, including on the Belgian-Dutch-French tripartite minehunter programme. Sea Naval Solutions and Belgium Naval & Robotics believe that the programme can help grow the Belgian industrial base and create jobs in a sustainable way, with Belgium Naval & Robotics planning to set up an ‘industrial centre of excellence’ in Belgium focusing on autonomous systems, robotics, artificial intelligence and cyber security. It has already established nearly 40 partnerships with Belgian companies around key aspects of the programme and its future development and is planning to present to the Belgian authorities a long-term plan to create hundreds of jobs over a 20-year period.